When you think of comforting, warming Winter desserts one dish comes to mind immediately – the traditional British Crumble! Whilst a regular version may pack a huge sugar punch, not to mention all that fat from the butter and custard, I’ve come up with a lighter, nutritious version, best enjoyed snuggled up on the sofa with the cold wind howling outside…. In a food processor, combine all the dry ingredients for the crumble topping – oats, flour, sugar and salt. Once these have mixed well, add the butter and milk. You may need to add a little more milk depending how dry the mixture seems, it should be firm and slightly moist but not sticky, ideally a dough like consistency. Set to one side and prepare the filling. Core and then dice the pears, add the chopped ginger and cinnamon to taste and combine well. If you like your crumble sweet you may want to drizzle with honey or agave syrup. You may also add other spices as well or instead of cinnamon, depending on your taste preference – nutmeg and star anise also go well with these ingredients. 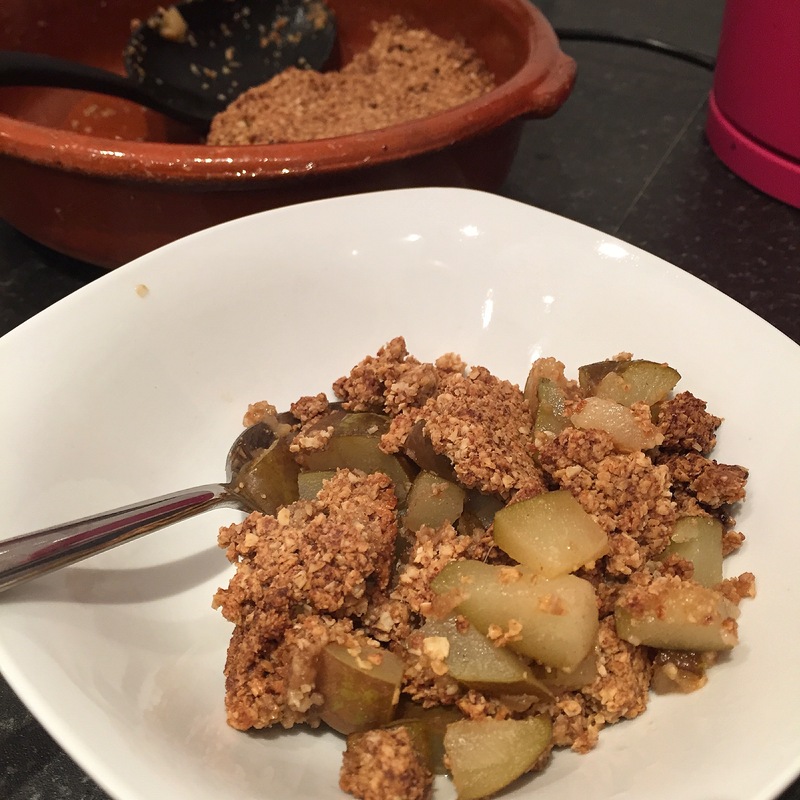 Place the pear mixture at the bottom of an oven proof dish and top with the crumble topping from the food processor, ensure the pear mixture is covered and press down for an even top. Place into the oven for 25-30 minutes, check every 10 minutes to ensure the topping isn’t burning, if so reduce the heat. Serve with greek yogurt, quark or even ice cream for an indulgent treat!